You'll be £16.99 closer to your next £10.00 credit when you purchase Assault on Normandy: Pegasus Bridge. What's this? This military DVD charts the slow development of British airborne forces and the directive given by Churchill in June 1940 to form both the Parachute Regiment and the glider airlanding brigades. We follow the plan to capture the two bridges over the canal and river between Caen and the sea from the germ of an idea, through preparations to its delivery as one of the most successful small unit actions of all time, in the opening hours of D-Day. The DVD is split into four parts and each concentrate on a particular phase of the D-Day fighting: First are the gliders and their pilots who delivered the force, against all odds, in a poor weather and darkness to the bridges. The surprise and pin-point accuracy they achieved contributed significantly to success of the operation. Next to be investigated is the thoroughly prepared and highly successful coup de main assault by Major John Howard's Company of Ox & Bucks Light Infantry on the two bridges. After a badly scattered drop, Colonel Pine Coffin's 7 Para Battalion, only a fraction of its strength, arrived to relieve the Ox & Bucks and fought an equally epic battle against the growing strength of 21st Panzer Division until they in turn were relieved on the evening of D-Day when ground troops finally arrived from the beaches. The famous Café Gondree is also included on the DVD. Indisputably the first house in occupied France to be liberated by the invading Allies, it was central to the story of Pegasus Bridge, its capture and holding. The family Gondree for their willing help and fortitude have over the years, become as much a part of all elements of Airborne Forces as the red beret! The small actions at each stage are well described by knowledgeable historians, each with a view of location as it is now, and the re-enactors to bring the scene to life. Recommended. This DVD from those lovely people at Pen and Sword encapsulates all that is good about a modern multimedia resource. It is comprised of the main documentary, a shorter supplemental piece and then numerous printable maps, documents, photographs and even a complimentary battlefield tour if you are lucky enough to visit the site of Pegasus and Horsa Bridges. In summary, if you know little about this small but significant action during the early hours of D-Day then this will increase your knowledge. And if you already know about it, then it is a useful and interested resource. This DVD follows on nicely from The Glider Pilot Regiment and is presented by the same two presenters. Their experience of battlefield guides and knowledge across the subject makes this an enjoyable and informative DVD. When the British airborne forces were born in the dark days of 1940, the RAF was focused on two battles. Over Britain the RAF Fighter Command was required to prevent the Germans gaining air supremacy as the essential prelude to invasion from France. At the same time RAF Bomber Command was looking for an excuse to break the political constraint, that had it dropping leaflets on German cities, and load bombs to destroy German industry and military targets. At that time the RAF was serious short of aircraft, aircrews and airfields with which to discharge these duties. When the Army was allowed to build up an airborne force of paratroops and glider pilots, the RAF saw this as a political threat second only to the Royal Navy's success in resting control of naval aviation from the RAF in 1938. As the RN success was to prove essential to protecting warships and convoys, while the RAF was too preoccupied to devote adequate resources to maritime aviation, the Army's airborne forces were to prove essential to aiding the invasion of Europe in 1944. Churchill broke the RAF resistance by ordering them to co-operate with the Army in the training of glider pilots and the provision of glider tugs, their crews, and airfields from which airborne forces could fly. Initially, paratroops and assault gliders were used in very small numbers to support Special Forces operations in Europe, usually in conjunction with local resistance fighters. Several of these tentative operations were unsuccessful and the attempt to land gliders in Norway to attack the heavy water production plant, supplying German nuclear weapons development, was a failure. What these early operations proved was that bombing was often unable to destroy specific high value targets and the only way to deliver the necessary force was to land gliders and drop paratroops with the appropriate weapons. The concept was proven but required improved training and equipment. The Hamilcar assault glider was built from non-strategic materials, where the US WACO assault gliders were built on a steel frame. When the first test came for airborne troops to support an invasion force during the Scilly landings, the airborne forces failed again. On this occasion, the reasons came from two factors. The first was that an trial flight of tugs and gliders from Britain to North Africa proved that this was not a viable method of staging aircraft and men through North Africa and on to the landing zones in Scilly. The distance was simply too great and the German air interception too strong for this long distance delivery to work. It was no reflection on the personnel, or the machines, but a case of attempting too much. The result was that US WACO gliders and US transport plane tugs were allocated to the British airborne forces and there was insufficient time to provide an adequate level of training for tugs and gliders. The second factor was a poor choice of landing zones. The result was that some gliders were cast off too far from their targets and were unable to make land. Those that were cast off close enough to make the landing zones found that they were less than ideal for glider landings and were in areas where opposition was strong against what were light infantry delivered by air without heavy support weapons. When it came only months later to plan the use of airborne forces to support the vital D-Day beach landings there was some opposition from those planning the invasion. So far, no one had demonstrated in battle that large numbers of airborne forces could be landed in hostile territory and survive. Those few successes by Allied and German airborne forces had involved small numbers of gliders and paratroops. The first use of large numbers to support an invasion of Crete by Germany had seen the German airborne forces so badly mauled that they were never again to be used in mass drops. The Germans also came to use their gliders mainly as supply transports and even added engines to some to enable them to take off in heavily loaded condition. The British glider assault on Scilly only confirmed the view of opponents that resources were better expended on conventional land forces and amphibious landing equipment. Churchill was again to throw his weight behind the airborne forces and D-Day planners consequently included large scale US and British airborne forces to attack targets behind the beachhead that it was hoped to establish. In the event, the airborne forces achieved mixed results and there were casualties because US paratroops were dropped away from their intended drop zones. However, the airborne forces performed magnificently under the conditions and fully earned their status as elite troops, taking on heavily armed German ground forces without artillery and tanks, or even heavy machines guns. Of a battle that achieved much, the outstanding action was by British airborne forces that were landed next to the Pegasus Bridge that was a key gateway for German reinforcements being rushed to Normandy, when the nature of the landings became clear, and an equally important route for allied forces breaking out of their beachhead and fighting through to Germany and final victory. The DVD tells the story of the British airborne forces and also the story of the French civilians. The DVD will entertain and inform a wide audience, but will hold a special importance to those who still run the Pegasus Café and those who each year visit the site of the battle, one of the most popular sites in the battlefield tours that bring the few remaining survivors of the battles, and now their children and grand children, to the scene of important points in the liberation of Europe. This DVD charts the slow development of British airborne forces and the directive given by Churchill in June 1940 to form both the Parachute Regiment and the glider airlanding brigades. We follow the plan to capture the two bridges over the canal and river between Caen and the sea from the germ of an idea, through preparations to its delivery as one of the most successful small unit actions of all time, in the opening hours of D-Day. The DVD is split into four parts and each concentrate on a particular phase of the D-Day fighting: First are the gliders and their pilots who delivered the force, against all odds, in a poor weather and darkness to the bridges. The surprise and pin-point accuracy they achieved contributed significantly to success of the operation. Next to be investigated is the thoroughly prepared and highly successful coup de main assault by Major John Howard's Company of Ox & Bucks Light Infantry on the two bridges. After a badly scattered drop, Colonel Pine Coffin’s 7 Para Battalion, only a fraction of its strength, arrived to relieve the Ox & Bucks and fought an equally epic battle against the growing strength of 21st Panzer Division until they in turn were relieved on the evening of D-Day when ground troops finally arrived from the beaches. The famous Café Gondree is also included on the DVD. Indisputably the first house in occupied France to be liberated by the invading Allies, it was central to the story of Pegasus Bridge, its capture and holding. The family Gondree for their willing help and fortitude have over the years, become as much a part of all elements of Airborne Forces as the red beret! 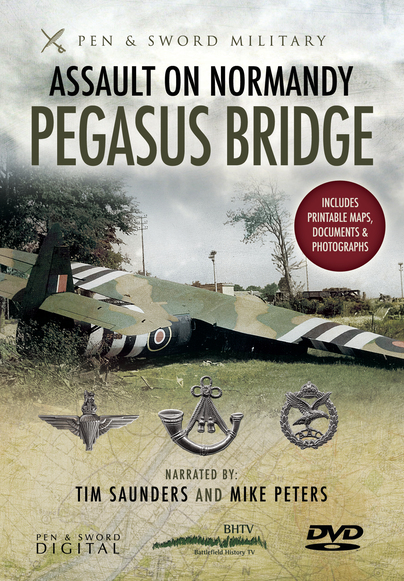 For anyone who isn't lucky enough to have visited Pegasus Bridge this DVD offers you the chance to see what the fuss is about. This is a fascinating into this most famous WW2 actions that is sure to be of interest to military historians and enthusiasts. Mike Peters - a serving officer in the Army Air Corps - is also a member of the Guild of Battlefield Guides. Throughout his over twenty years of service, the importance of the history of the forebears of his Corps, the Glider Pilot Regiment, has grown on Mike.